-Projects Scenes from inside your home to windows: It will be seen from outside. - Kit includes the following: PROJECTOR, with built-in speakers & 3.5mm stereo output. SD CARD, REMOTE CONTROL, multi-function remote for additional operation. FLEXIBLE 6" ADJUSTABLE TRIPOD, to elevate projector. PROJECTOR SCREEN, 4'x6' white translucent rear projection screen (86.5" diagonal) for vertical or horizontal use. 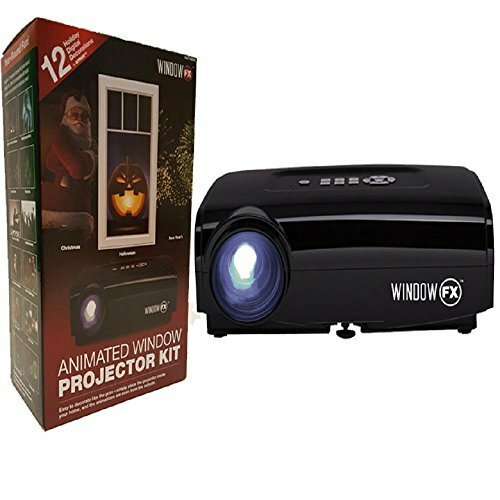 - Includes 12 Holiday Digital Decorations: 6 Halloween; 3 Christmas; 2 Celebrations; 1 Winter Wonderland. - Compatible with most formats so you can create your own. - Fits horizontal or vertical window. - Option to purchase additional scenes. If you have any questions about this product by WindowFX, contact us by completing and submitting the form below. If you are looking for a specif part number, please include it with your message.